Are Your Kids Ready to Visit the Dentist? Dr. Kevin Brown can help set your kids on the path to lifelong dental health, which is why it’s so important to make sure that their first visits go well. Young children are often nervous or outright afraid of visiting the dentist’s office. However, you can talk to your kids and help them get ready for a relaxing, pain-free dental checkup. Ask your kids what they think happens in the dental clinic. Young children absorb all sorts of ideas from TV shows, listening in on their parents’ conversations, and chatting with their friends. They may have a pretty good idea or some strange and funny notions. In any case, this will tell you where to start the conversation. First tip: Don’t mention words like shot, scary, hurt, pain, drill or other negative words. These are words we think of that scare us. You don’t want to accidentally give them the wrong idea about what happens in our clinic. 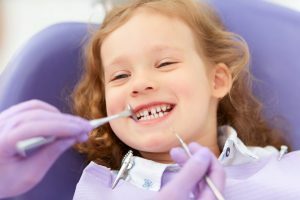 Dr. Brown has undergone two years of additional training in pediatric dentistry and child psychology and it will amaze you with what he can accomplish with your child. Sit back and watch him work. Second tip: Think of age-appropriate ways to explain things. Instead of saying ‘we brush to get rid of plaque,’ you can say ‘we brush to clean our dirty teeth,’ and ‘Dr. Kevin will use his fancy toothbrush to tickle away the sugar bugs’. You and your kid will go to the clinic. You may have to wait for a few minutes. There will be magazines, toys, and maybe a TV to watch. The dentist may see the child alone (for older kids) or you will come in with them. The dentist will count their teeth with a little mirror and ask questions. They may clean your kid’s teeth or put something (vitamins, AKA, fluoride) on them. After the checkup, the dentist will talk about how to take care of your teeth. If your anxious child has a favorite toy, maybe he needs a dental checkup, too. Explain to your kid that the favorite stuffed bear is coming along. The child will be able to hug their toy and focus on something other than being nervous. Before the visit, talk about how you’ll treat them with a trip to a new playground or watching their favorite movie. This will remind them of the reward coming and help them focus. Finding the right pediatric dentist is a big decision. Alpine Kids Dentistry is experienced in working with children of all ages. Visit our Alpine Kids Dentistry website or call us today to find out how we can help you.